It’s never too late to post a race recap…right? My Memorial Day weekend is definitely unique! 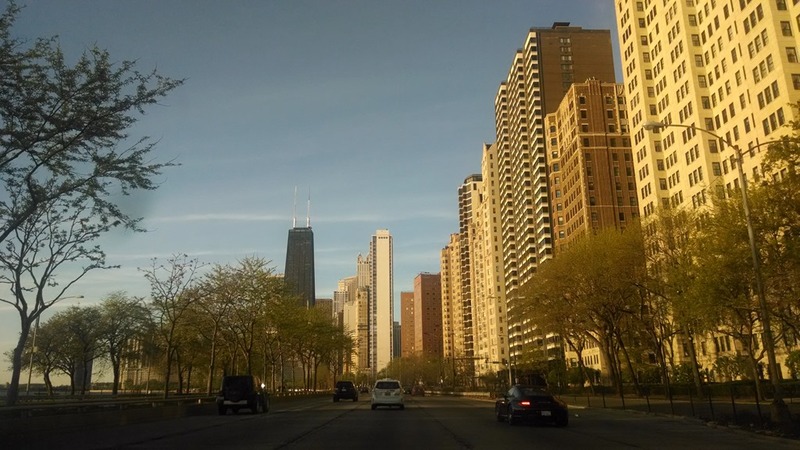 Instead of bouncing from BBQ to BBQ or joining my family at the lake (or my brother in Indy), I spent Saturday and Sunday on Lake Shore Drive. I think that this was my 5th time running the Soldier Field 10 Miler (but don’t quote me on that). I have run this race quickly and I have run this race more slowly. 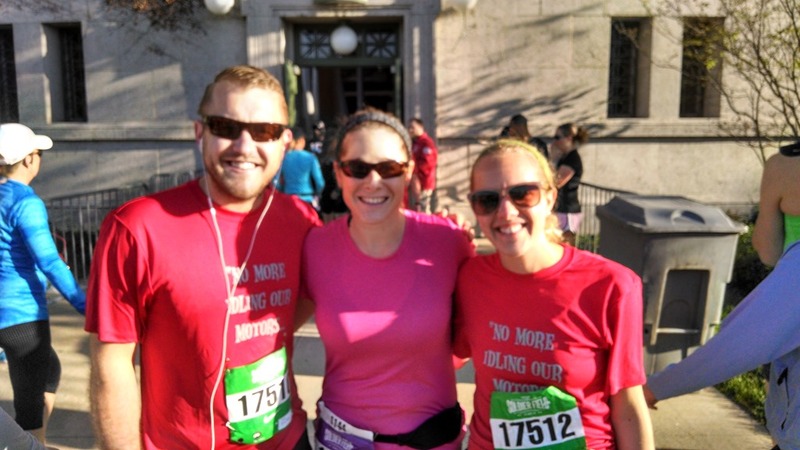 This year, my plan was to run this race with my old coworker and friend. We have been trying to find a time to get together and catch up, but both of our schedules are busy. What better time to chat about patients and life than on a beautiful 10 mile morning run. For the first time, we decided to drive downtown Friday night after work and stay in the city. That gave us some awesome dinner options. I had the most untraditional pre race dinner EVER! I laid off most of the cheese, but BBQ is way different than my typical whole wheat pasta with spinach, protein, and olive oil. I still went to bed super early, knowing that I had an early AM ahead of me. The BOY drove me down to Soldier Field, where we met up with my friend and her brother. He was running his first race, an ambitious and impressive 10 miler! As the national anthem began, we shed our layers and said our goodbyes to the BOY who went off to find a comfy seat in the stands. We ended up starting in the second to last corral, which gave us plenty of time to chat before we even got close to the starting line. 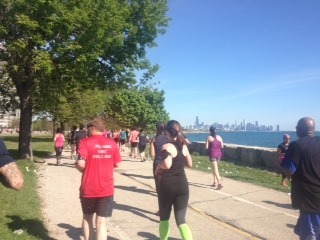 It was a gorgeous day for a run and we slowly made our way south down Lake Shore Drive quickly changing topics as we tried to share all of the stories we used to tell daily when our desks were next to each other at work. We were running about 10 minute miles and stopped for bathrooms and water as a group as needed. At the half way point, everyone was feeling strong. The view back to Chicago is my favorite! Being this far back, the pack never really thinned out so there was some mild confusion when I tried to suggest a ‘groupie’ in front of the skyline. It ended up being a ‘Where’s Waldo?’ photo of my hands : ) Can you find me in the picture on the right??? Not to worry…we got ourselves pulled together by mile 7! Along with some video…which gave me an error the 3 times I tried to post it below. 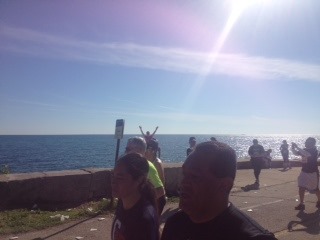 Our newbie runner kept a consistent pace as we made our way back towards soldier field. There wasn’t a dull or quiet moment throughout the 10 miles and despite our easy pace, I was surprised with how good I felt during my first 10 miler of the year. We crossed the finish line in style (with another video) and directly behind a wedding proposal. I missed it but heard all of the congratulations. Immediately, we began taking photos on the field (even though I was just here 2 weeks ago). We met the BOY at the post race party for our celebratory free beer. I mean, even though we talked more than we ran, we earned it! Ha ha! The BOY earned his beer by being our gear check and photog. And because he is overall totally awesome and was my bike valet all weekend! Our celebration was the perfect ending to our 10 mile coffee date and celebrating a first time runner’s incredible accomplishment! I have run many races in my day. As I am not a professional runner, I have always understood that my goal is not to win, but I like to run fast and challenge myself to beat myself. However, one of the best lessons I have learned over the past few years is that not every race has to be epic, but that it can still be successful and memorable. I’m also thinking that I need to schedule more 10 mile coffee dates. Is anyone interested? Post race, the BOY and I went walking around Southport. I had a Lulu gift card (it’s totally the way to my heart) burning a hole in my purse and we spent a good hour sniffing tea at the new Teavanna Café. 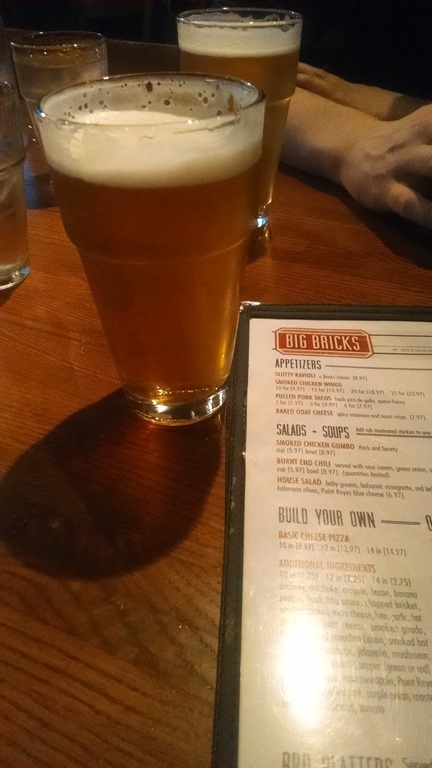 After shopping, it was time for some carbs…I still had a long bike ride ahead of me this weekend! And then…a 2 hour nap! No joke, I slept for a full 2 hours before the BOY woke me up for dinner and the Hawks game. Despite being in the city, we decided to have a quiet night in with some local Thai food. I was back in bed at 10pm with an early alarm set for Sunday morning’s Bike the Drive. 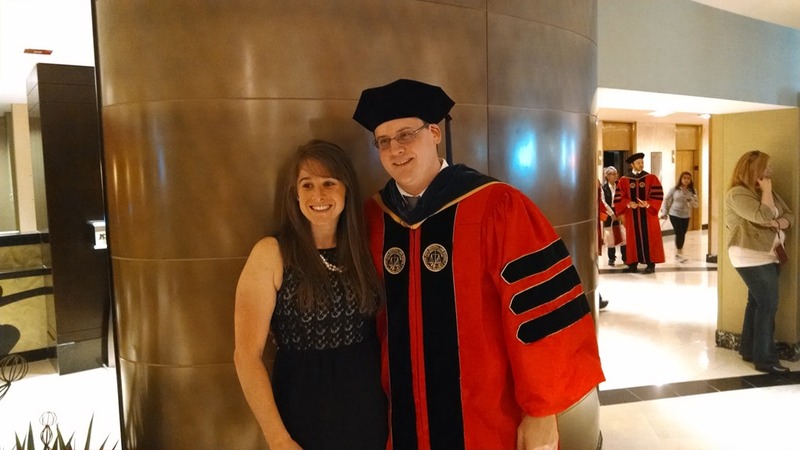 I had the most wonderful weekend for soo many reasons (and I don’t even know my time for the 10 mile run). It was great to be outside and active after the long winter we had, and also it was special to spend the weekend with the BOY before he dives head first into studying for the Bar. 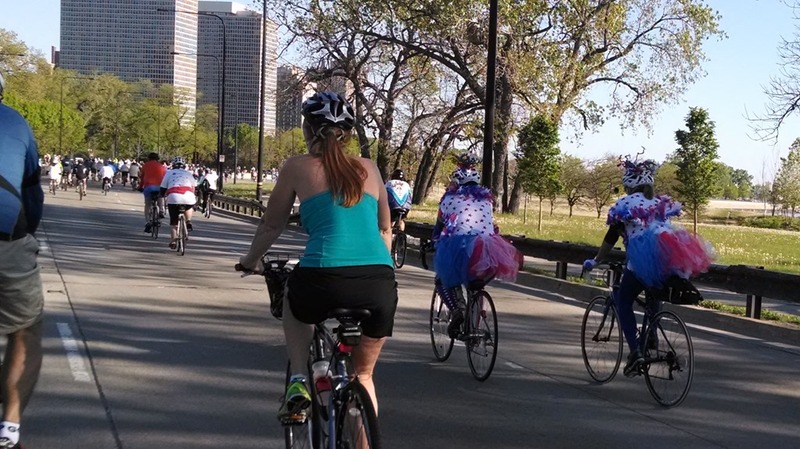 Looking forward to being back on Lake Shore Drive again next year! Do you race to race or race for fun? I am working on getting my 10 miler race recap to you, but also this week, I am working (and have been crazy busy)! I did manage to sneak in an Intro to Aerial Yoga Class with my mom in between long work days and early morning exercise classes. I hope you are hanging in there this week too! Tell me…how fun does this look? Now that finals are over and graduation behind us, the BOY has been coming to the grocery store with me. For the most part, I like this. He picks out meats to grill for dinner on my late work nights and it’s nice to have the company. On the contrary, I always spend more money when he tags along and he has lots of opinions about food (in general). Last week at the store, he decided he wanted Crabby Mac for dinner. I explained that that wasn’t going to happen with last week’s crazy work schedule, so when we were back at the grocery store yesterday, I suggested mac n cheese for dinner tonight. Despite being a holiday, this morning began earlier than my usual Monday. After an active weekend (10 Miler recap to come…I’m just waiting on some pics from my running buddy), I scheduled a 7am workout with my trainer. I couldn’t keep my regularly scheduled appointment because I had an intense lower body massage to work on some hamstring adhesions. My trainer didn’t take it easy on me, but I did ask if we could focus on my chest, arms, and back instead of my legs. My legs got their own work up during the massage when I just about jumped off the table as she found my hot spot (left ITB) and then another one (right proximal hamstring). I was sore, but the adhesion felt looser, so it was worth it when I emerged back into the sun light for a Starbucks Green Tea Latte. We spent lunch with friends who smoked some incredible ribs. When the BOY and I arrived home at 4:30pm, I was ready to crash on the couch with some TV and email. Which is exactly what I did for 2 hours before getting started on dinner. I found this recipe online and decided to try it because it looked simple and quick. I adapted it slightly to add in crab meat. 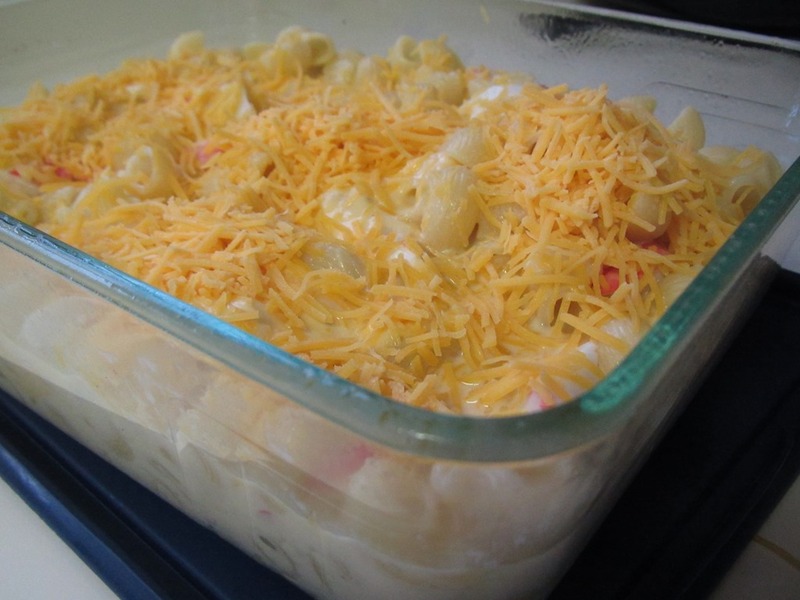 The BOY was excited to dig into this cheesy dinner and somewhere in between bites, he looked over at me and said ‘Mmm…This is…Mmm…Delicious…Mmm!’ Count this recipe as ‘BOY APPROVED’! I still have some emails to respond to and research to do before tomorrow, but I’m going to enjoy just a little more down time first. Hope you had a nice long weekend! What did you do? How did you spend your Memorial Day Monday? 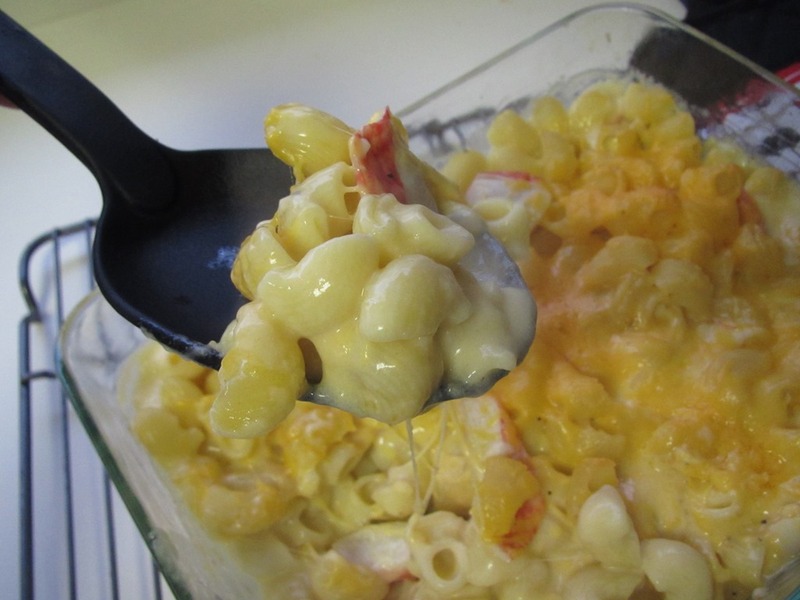 Whisk in salt, black pepper, 1 cup shredded cheese, until smooth; stir in pasta and crab meat (if desired). Spoon pasta mixture into a lightly greased 2-qt. baking dish; top with remaining cheese. Bake at 400° for 20 minutes or until golden and bubbly. I wouldn’t have Memorial Day Weekend any other way!!! This year, I’m going backwards with my recaps. And since this is my 5th year in a row doing Bike the Drive, I attempted to get some different views from the drive. My alarm went off at 6am this morning. I was surprised to discover that I wasn’t at all sore from yesterday’s 10 mile run. 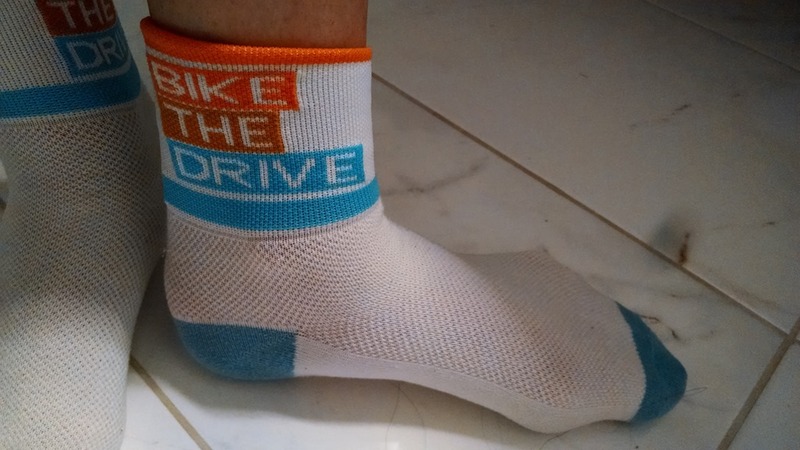 I dressed in my festive (and very appropriate) Bike the Drive socks and was fueled, covered in sunscreen, and on my bike heading east towards the drive at 6:30am. This was only my second ride of the year, and I was psyched for the perfect biking weather. During my first ride, my bike computer battery appeared low and this morning, it was downright dead. I was annoyed for a second and then decided that it would be fun to just ride free. No knowledge of speed, no knowledge of distance! I entered the drive at Addison heading south. There were already tons of riders out enjoying the beautiful morning. I think this event may have gotten more popular over the past few years. 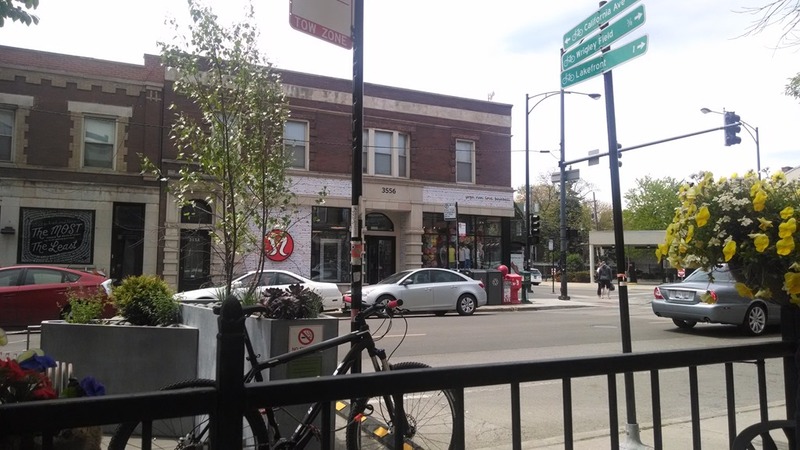 I got a chill as I pedaled quickly down towards Michigan Avenue. I really was riding FREE! Free to ride my bike through one of the busiest streets in Chicago, free of stress, free of expectations, free to go as fast or slow as I wanted, and free to make the day my own! I rode south towards the Museum of Science and Industry observing the famous Chicago landmarks and new parks and buildings on the way. I saw this sign yesterday during my run but didn’t have my camera. I was happy to be able to snap a photo of it today. It just makes me smile! The museum was crowded as expected as everyone stopped to refuel and take photos in front of the museum. Including ME! I didn’t stop long before starting my 15 mile trek north to Bryn Mar. One of my favorite things about Bike the Drive is watching every age, size, and ability come together on their bikes that also come in tons of different shapes and sizes. This year had its fair share of dogs in costumes on bikes and people in costumes on bikes. I rode all the way back north to the next rest area where I took a little snack break. Then rode back to my starting point where I exited the drive and rode west to where we were staying. After 3 hours on my bike, I felt awesome and super strong, but didn’t want to push past ~32 miles for just my second ride. Yesterday, I refueled with beer carbs and today I went with the Starbucks run on our way back to the suburbs. Did you ride or race this weekend? Do you have any Memorial Day traditions? Instead, I will bottom line you that it’s 85 degrees and I just wasn’t in the mood for curry. I had an easy back up plan before I even walked in the door…roasted tilapia with mushrooms. The BOY didn’t really care, so he said, as long as I was making dinner. I told him that I would make dinner if he emptied the dishwasher and chopped the mushrooms. Done and Done! Next up…finally making the crockpot recipe I had planned to make on Monday. This looked like a super easy recipe and I had leftover orange spread from my previous go at Crockpot Orange Chicken earlier in the month. This recipe looked different enough (no BBQ sauce, more OJ) and used some of the same ingredients. I had everything done and cleaned up before the 7am puck drop! Now that’s my kind of cooking! On a totally different note, does anyone read Lauren Conrad’s blog? Her Bikini Bootcamp post suggests doing 50 sit ups (with good form) and a 60 second plank every morning and a 60 second side plank on each side at night. It’s been a REALLY LONG time since I’ve done a Plank Challenge, and so I think I may give it a try. So far, I’m 50 sit ups and one plank in. And just in case you were craving Tilapia Curry, here is an authentic looking recipe! I’ll let you know how my orange chicken turns out after I have it for lunch tomorrow! Do you ever do exercise challenges? Have you ever eaten Tilapia Curry? Spray crockpot with cooking spray. Place chopped chicken and onions in the bottom of your crockpot. Combine all of the other ingredients in a small bowl, whisking until well combined. Pour orange juice mixture of chicken mixture and stir gently. Cook on low for 8 hours (or high for 4-6 hours). Double the Workouts…Double the Fun! Winding down a 4 day weekend is never easy! Who wants to go back to work?! And after the weekend we had, I would have preferred to keep the celebrations coming! We got home late Sunday night and both crashed into bed. Monday morning, the BOY was awake and wired with lots to say and discuss at 5:30am. Which then led to him inviting Cooper (also wide awake) into our room where he immediately decided he wanted to make up for a weekend’s worth of cuddling. Then there was apparently more to discuss….Ughh! At 7am, the BOY mentioned breakfast, so we made our way to the grocery store. Do you know how empty the store is Monday morning before 8am? We stocked up for the week and the BOY found a HUGE cinnamon roll for breakfast. My goal for the morning was to get my bike up and rolling. So after unpacking groceries, I cleaned organized the garage and pumped my bike tires full of air. I was beyond thrilled to be reunited with my bike after the long and grueling winter. I immediately found my way back to the path. I rode along enjoying the perfectly spring like weather, complete with a cool breeze. The wind was tough to pedal against, but in the end, I rode a lovely 9.5 miles. A wonderful first ride of the year. I had just enough time to freshen up and grab a bite of leftover pizza before heading back out the door for an eye doctor appointment. 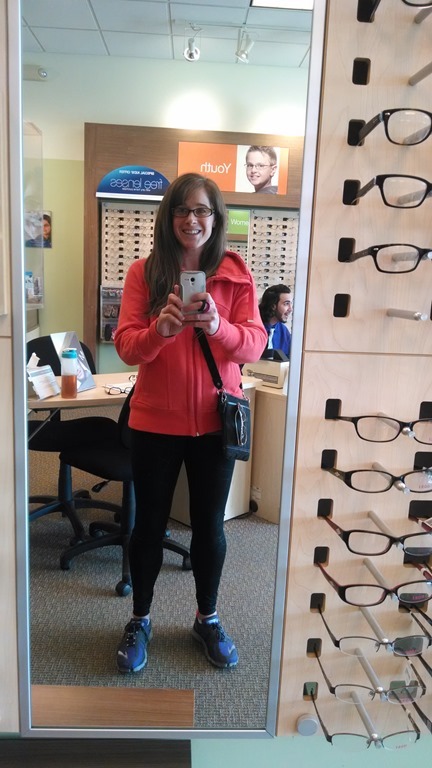 A years worth of contacts and (finally) a new pair of glasses later, I was back on the move. I dropped the BOY back off at home and then went over to the yoga studio. I was meeting my mom for a session with my trainer. We talked a bunch about health and wellness before diving into some challenging strength moves. We were both sweating by the end and decided to hit Starbucks for a post workout beverage. I had a bunch of errands to run and coupons to spend and my mom decided to tag along. We went to the huge mall by our house which was nice and empty on a Monday. 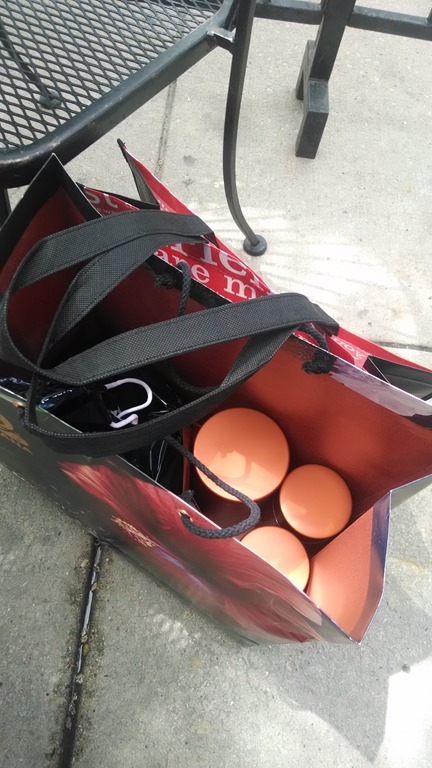 I had an awesome Kiehl’s coupon and as I was walking out of the store, I spotted a huge area of red. I knew exactly what it was and after years of complaining that this huge, popular mall didn’t have a Lulu, finally here it is! Well, almost! The door is still locked : ) I walked in the door to my house at 7pm with an enthusiastic welcome from the guys (BOY + Cooper = Guys). The BOY made the most delicious dinner and I settled in for the night. I had planned on making a cookbook crockpot recipe for lunch this week, but it was too late in the evening. I guess I will have to get to it later in the week (hopefully recipe to come). This morning, I was back on the path (with tired legs) for a 6 mile run. I think this will be my last run before this upcoming weekend’s 10 miler, so I was happy to get in a middle distance before work. Officially, I have now run, lifted, yoged 8 days in a row. I am looking forward to a well deserved rest day tomorrow! Do you ever exercise twice in one day? How was your weekend (in 3 words)?? ?